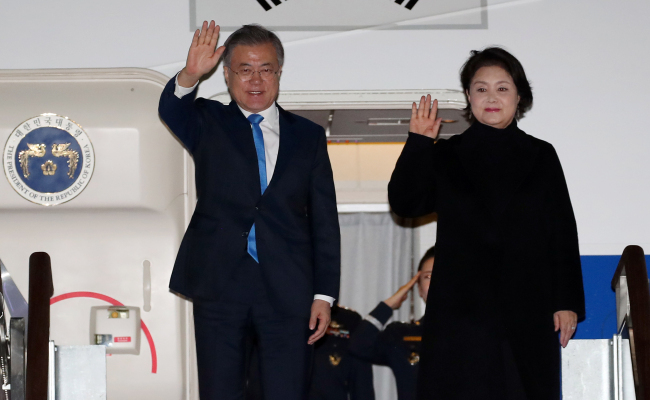 President Moon Jae-in returned home Tuesday after a three-nation tour that began a week earlier in the Czech Republic. In Prague, the president held a meeting with Czech Prime Minister Andrej Babis to discuss ways to improve the countries' ties. His tour then took him to Argentina, where he was joined by the leaders of 19 other developing and developed nations for the annual Group of 20 Leaders' Summit. The annual meeting, held in Buenos Aires, also provided the venue for a series of bilateral meetings with other global leaders, including U.S. President Donald Trump and Argentine President Mauricio Macri. His latest stop was in New Zealand, where he made a three-day state visit. The visit sought to enhance Seoul's bilateral ties with New Zealand. In a summit with Prime Minister Jacinda Ardern, Moon stressed the need to combine the countries' strengths to develop their relationship into a more future-oriented partnership. Moon also invited the New Zealand prime minister to visit South Korea in the near future.